These are dangerous situations, always call a professional right away. Do Not Touch The Door. Is your garage door off the track? We can help! The professionals at Southwest Garage Doors know how to get your off-track garage door back in order. 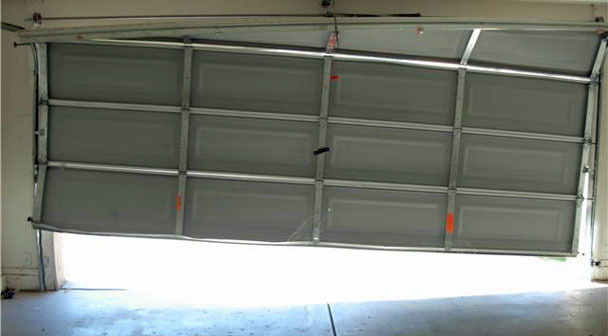 If your garage door has come off the track, the first thing to remember is not to touch it or try to fix it yourself. Most of the time, the right know-how and tools can get your garage door working perfectly again, but an off-track door can be dangerous. A broken garage door also prevents you from accessing your garage’s content. So, don’t wait! Give us a call today. An off-track door appears to be crooked, a symptom that your door’s rollers are no longer held in the track. What causes this inconvenient and hazardous problem? You could have damaged cables or perhaps a failed spring. Whatever the cause, Southwest Garage Doors has the right solution to get your door back on track and working smoothly quickly. When your garage door is off the track, we know what a hassle it can be. Our 24/7 emergency services and our easy-to-use online booking allows you to schedule your repair services when you need it to get your off-track door working quickly, safely, and at a price you can afford. 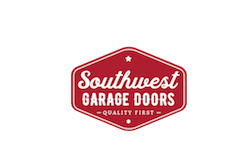 At Southwest Garage Doors, we value craftsmanship above all else. We won’t skimp on the details. You’ll appreciate the care and attention we give to every job, no matter how big or small. We are available 24 hours a day to help you with your garage door emergency. We know that having a garage door that is off-track or stuck can cause significant problems and delays in your life. We are always on call to help you in your time of need. We’ll use high-quality parts and components, ensuring your door will continue working properly for many years to come. Our promise to every customer is to offer top-quality work at an affordable price. Our honest, up-front pricing shows you exactly what you are getting for your money, and you’ll feel your money is well spent. Call today or book using our convenient, online booking tool. Our highly-trained, professional service team will get to work right away to solve your problem, and your garage door will be operating smoothly again soon. Let Southwest Garage Doors help you get your garage door, and your day, back on track. First off, DO NOT TOUCH THE DOOR!!! Save that for a professional, It will only get worse and end up costing you more money. When a garage door falls off track the door will appear to be crooked in the opening causing rollers to fall out and bending the track out of alignment. This can be fixed and 95% of the time and the door does not need to be replaced. Im sure it’s happened at the most inconvenient time possible for you. So, use or link to book an appointment right away.